Today's Executive Order on "extreme vetting" of refugees from predominantly Muslim countries marks yet another betrayal of American values and our longstanding commitment to immigrant communities. President Trump's divisive effort to keep out "radical Islamic terrorists" is one of the first steps in his promise to openly discriminate against immigrants of Muslim faith. If you would like to volunteer with our team, please follow this link to sign up and learn more about ways you can help! 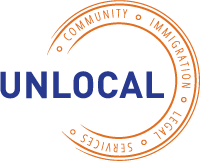 Copyright © 2019 UnLocal, Inc., All rights reserved.